the tower in addition to the trails. up to the tower to Crescent St. 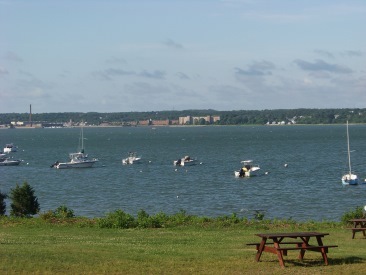 This slice of historically valuable land that makes up the park should not be missed during an explore of the town of Duxbury! to the large parking area. There is room for a couple of cars in front of this gate. 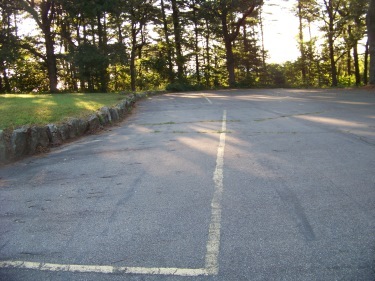 The hike up to the tower area in the off season is by the road leading up to the parking area at the top of Captain's Hill, the highest point in Duxbury. 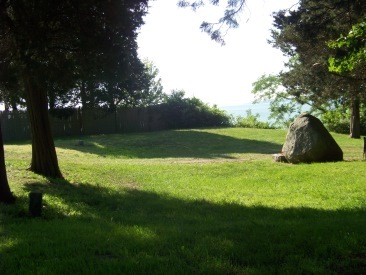 Captain's Hill is a drumlin formed during the last ice age. Drumlins are elongated hills formed by glacial ice moving over rock debris. Usually they have a side that is long and sweeping up to the height of the hill it created and the other side is steep even cliff like at times. The bottom of the tower is interesting. It is made up of large granite blocks forming an octagon. Above the door are plaques naming the New England States and on each side of the octagons two neighboring counties of Massachusetts are listed. The beginning work on the monument started in 1872. It was completed in 1898. The base is a 116 foot shaft containing the 125 stairs to the tower. The top of the shaft sits the 14 ft statue of Captain Myles Standish. Together it makes itself a prominent landmark by sea or land for those in the area. 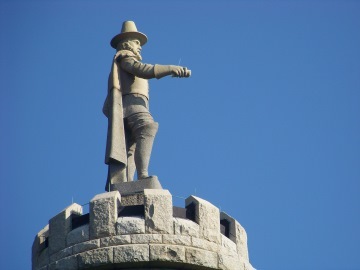 This drumlin with it's statue of Myles Standish is one of the landmarks that can be seen while visiting the beach in Plymouth along the seaside trail. 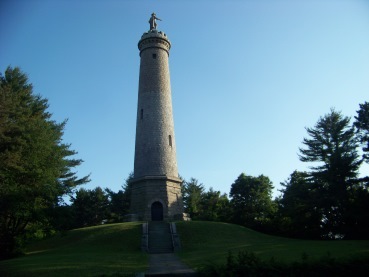 Myles Standish Monument State Reservation is located in South Duxbury in an area once known as The Nook. 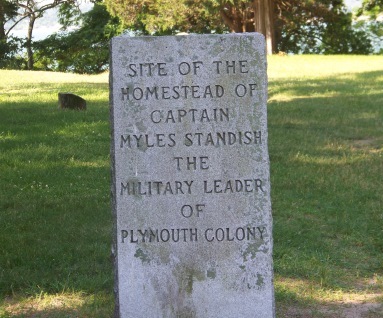 Now referred to as Standish Shores, it is the same area where Myles Standish took residence. Starting from where the sign is located on Crescent St. follow the road to the parking lot. This starts gently uphill with obstructed views to the right of Kingston Bay. 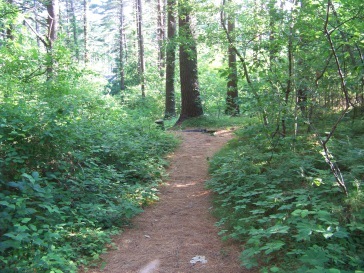 With your attention to the right, trying to catch a view of the water, you will most likely miss a very narrow hiking trail leading off to the left. 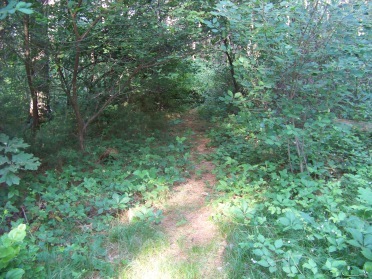 This is the longest of actual hiking trails on the property, but is has not been maintained in a while. It would be the most challenging trail if found and used, mostly it is an all uphill hike from this direction. On the main road the way continues increasingly more strenuous uphill and another hiking trail emerges at .21 miles, this is a bit of a shortcut through forest. The road then splits at 1/4 miles. Straight continues uphill toward the monument. Going to the left is a bit easier as it levels out and sweeps around to the left of the monument. Shortly after taking this left the other end of the shortcut trail emerges and not long after that the longer narrow trail emerges as well. Only a few short steps past this intersection and the service road to the water tower that stands in back of the monument leads to the left as well. 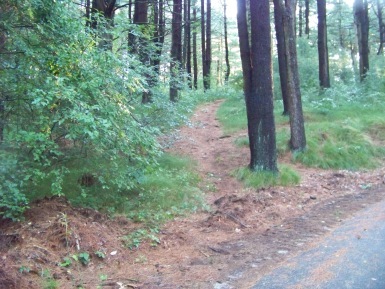 At 4/10 miles the trail leads into an under used parking lot. included a couple of spots for buses! 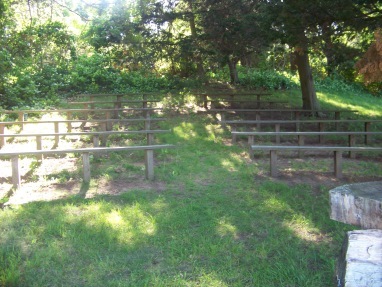 The original intention was for this to be a well used recreational spot. There is plenty of evidence that this park is tended to, cut grass, plastic liner in the trash barrel and picnic tables in season. 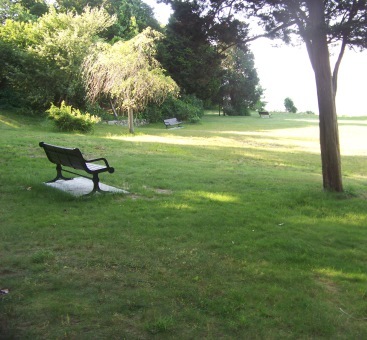 There are stepping stones to the right of this lawn. Following along these will bring you to the hiking trail down the other side of the hill. 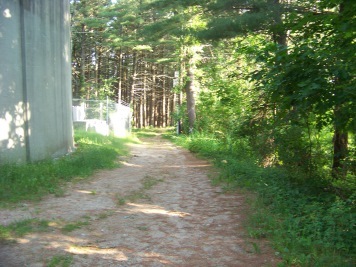 hiking trail follows past the water tower. 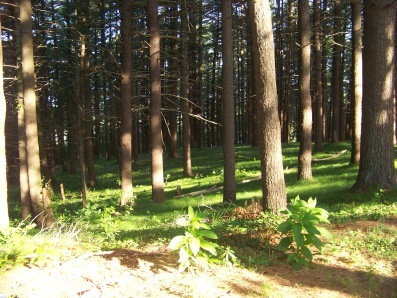 a large grassy pine stand. 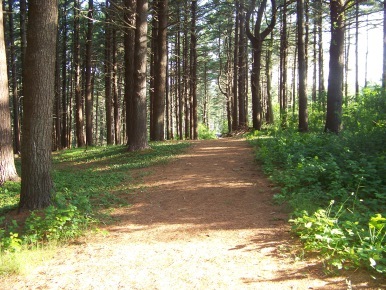 The trail goes by a forest re-use project in the pine grove. It appears to be an enclosure of some sort. 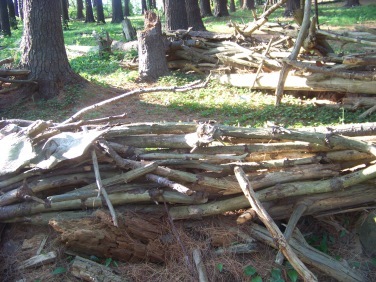 Good idea for that fallen material over the winter season. Cheap fencing for suburban homesteaders! This was a workout just going down the hill to access and investigate! The trail becomes increasingly steeper after this point. It ends with a small set of steps that let out onto Crescent St. Taking a left here you can make a full circuit to the gate where you parked or you can retrace your steps and investigate other trails in the reservation. 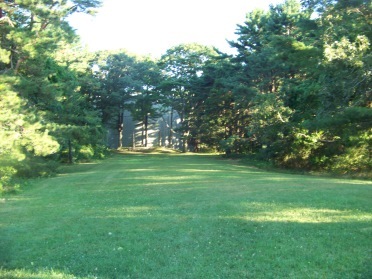 areas to enjoy are the Myles Standish Homestead site and Howland Park. Continue down Crescent St and you will find Howland Park on the right. 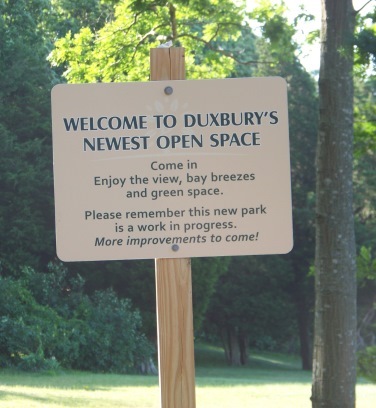 This new park of open space in Duxbury looks to be the perfect spot to take a rest or picnic lunch at. The dirt road in to the park is a boat launch as well. Many of the area residents have started making well use of the area. far corner under some trees. events are in the future plans here!! 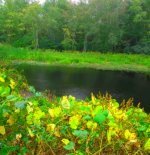 The homestead of Myles Standish is another area that can be visited not far from the monument reservation. 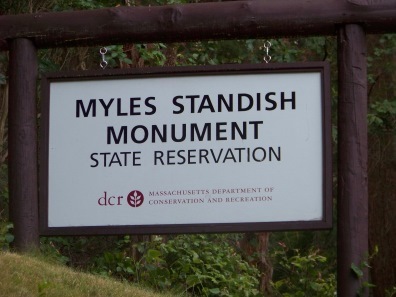 The myles standish monument is open on weekends throughout July and August! Hours are 9-5 but was advised to plan on 10-4. A park ranger will be on site. Take exit 10 on route 3. Follow route 3A north along Tremont St. Take right on Chestnut St. Follow to end and around small rotary to Standish St. Take a right on Crescent St. Entrance to park is on the left. 2-3 vehicles when park is closed. Large parking lot when open. Short: all trails are under 1/2 mile. Directions: continue down Crescent St. Park will be shortly down street on the right. Directions: continue further along Crescent St. Take a right on Marshall St. Follow to end taking a right on Massasoit Rd. Take a left on Mayflower Rd. At the end the homestead site will be the property to the right. Parking: very limited 2 vehicles along fence. 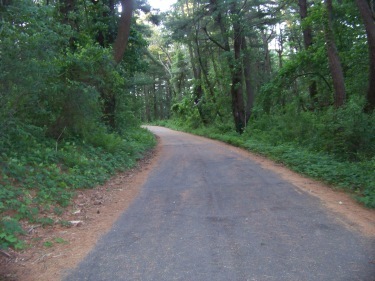 Many make these parks a bicycling route!